Official issue in 1914, the goggles have a basic one-piece rubber frame fitted with oval shaped laminated clear glass lenses. Simple elasticated strap with clasp fastener. 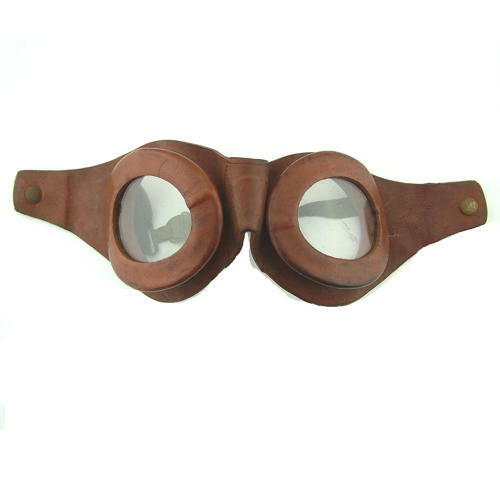 These goggles feature frequently in period photographs, particularly RFC Other Ranks who used issue kit rather than the private purchase favoured by officers (see photographs 8 & 9). Use of the first pattern goggle was short due to the introduction of the gogglemask in 1915. Condition is generally excellent. The frame is a little grubby but remains completely flexible and the lenses are undamaged. The strap retains reasonably good elasticity. A rare find in this condition. Stock code G22632.